An oil silo, or LPG Vessel, is a storage container for compressed liquefied petroleum gas. Oil silos are fully pressurized, waterproof, and built to meet industrial standards. There are approximately 49,000 oil silos in over 660 oil refineries worldwide! As the human population increases at an exponential rate, oil discovery is decreasing at an exponential rate. Natural gas is becoming scarce and oil silos are now becoming abandoned as storage containers. As Earth rapidly approaches Peak Oil, non-renewable fossil fuel resources are diminishing fast. Soon humans can no longer depend on natural gas as an energy source. At this point, humans cannot use the existing 49,000 oil silos as fuel storage containers. Oil Silos will all be emptied and abandoned. 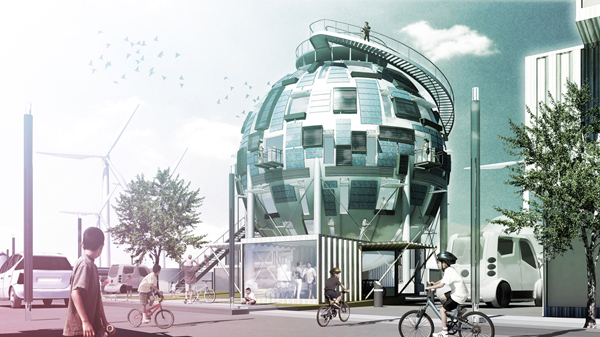 The Oil Silo Home designed by Pinkcloud recycles existing empty oil silos by transforming them into affordable housing for families worldwide. 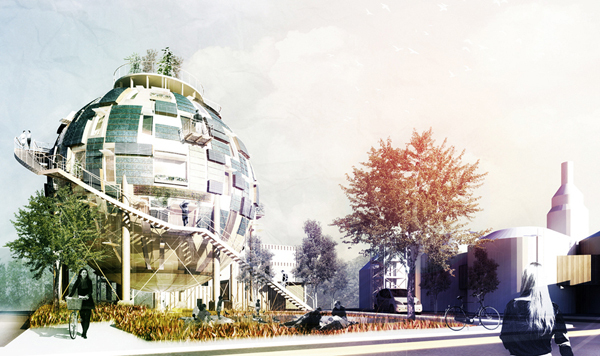 It’s a 100% self-supporting housing solution for the post-oil world. 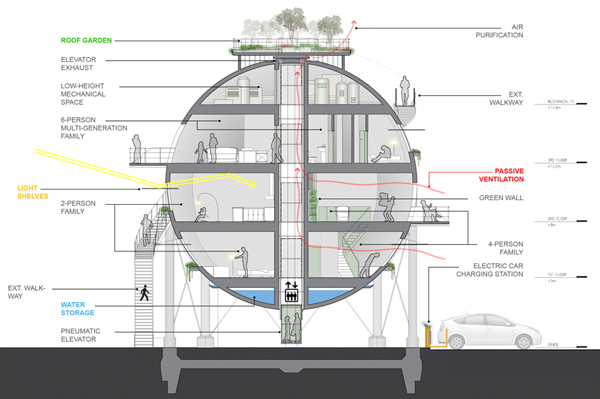 As an adaptive-reuse design, the Oil Silo Home incurs extraordinarily low costs. It’s highly structurally stable, efficient to assemble and disassemble, and has the capacity for pre-fabrication and mass production. Waste and embodied energy are dramatically reduced by the Oil Silo Home. By recycling existing abandoned silos for housing, we can revitalize former oil refineries and industrial zones into healthy, thriving communities. 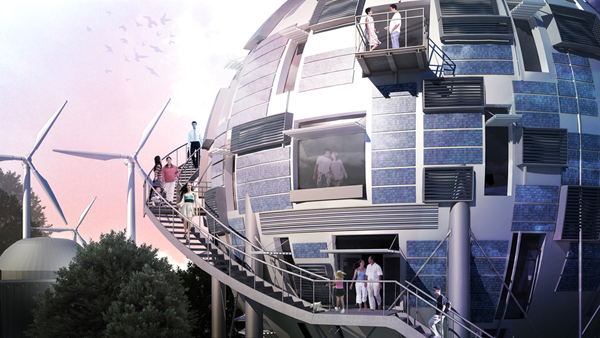 As a carbon-positive design, the Oil Silo Home can actually contribute energy back into the grid. Contaminated oil silos are first detoxified with In Situ oil bioremediation. In this process, soil microbes which eat harmful pollutants clean up toxic chemicals, leaving only harmless byproducts such as CO2 gas. Existing oil silos are then retrofitted on-site. 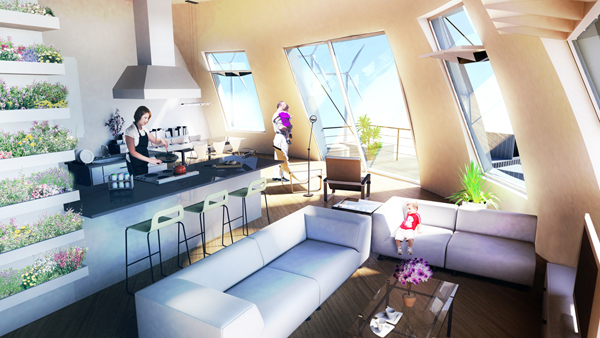 Large-scale components for the Oil Silo Home are pre-fabricated offsite. Modular assembly reduces construction cost and manufacturing time, thereby enabling consistent quality and efficient mass production of silo home components. 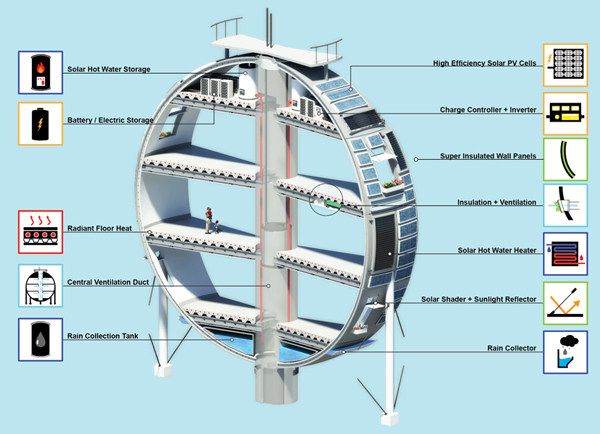 The Oil Silo Home is designed to generate energy while simultaneously reducing energy use. 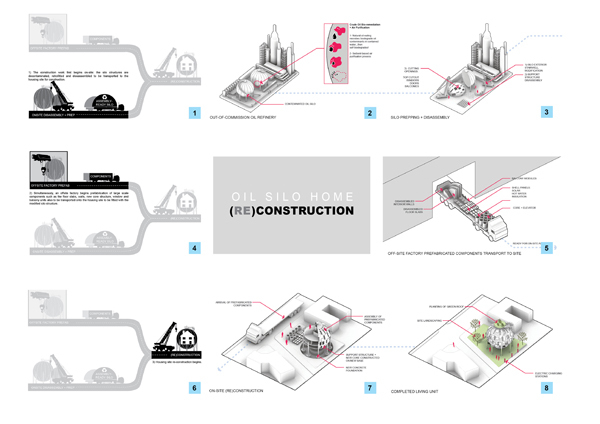 Our design comprises an integrated set of passive sustainable installations augmented by the silo’s inherent spherical shape. The Oil Silo Home exceeds a carbon-neutral classification and ultimately strives to achieve a carbon-positive rating, thereby benefitting the environment by producing more energy than it consumes. The 700 existing oil refineries have great potential for redevelopment. Refineries can actually be converted into thriving green communities which generate clean energy. Oil Silo Home communities have the capacity to effectively transform existing refineries into mega solar plants which produce clean energy.